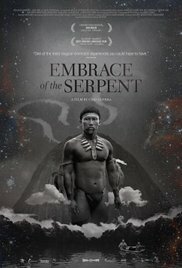 Embrace of the Serpent is a fascinating, strange and beautiful film, although the two people sitting next to me at the BFI failed to agree. Bored throughout they left about ten minutes before the end. Yes, ten minutes before the end. Perhaps they had a train to catch. It plays with time in an interesting way twisting one man’s story around two periods of time. He’s both young and old. The film I think doesn’t quite have the courage of its convictions, which would have made the temporal aspects even more fluid but it seems to me that there’s supposed to be no time here. Everything is now even though there’s past and present tales being told there isn’t any past and present in the film. This is reflected in moments where the two strands of the story almost meet. Directed by Ciro Guerra, who spent three and a half years going backwards and forwards to the Amazon. It’s loosely based on the real life stories of two Western travellers into the Amazon – Theodor Koch-Grünberg and Richard Evns Schultes – but the main focus of the story is Karamakate, an Amazonian Shaman. He meets the first Western traveller Theo (Jan Bijvoet), who is sick and is hoping Karamakate can guide him to a plant that will save his life, when Karamakate is a young man & played by Nilbio Torres. Later and older – and played by Antonio Bolivar Salvador - he meets Evan (Brionne Davis). Evan is searching for the same plant but for different reasons. The film draws one into the quests up river and the creeping madness it seems to cause in Theo and Evan. And others. It reminded me of both Aguierre, Wrath of God and Apocalypse Now (and through Apocalypse Now to Conrad’s Heart of Darkness.) Perhaps more personally it reminded me of Peter Weir’s The Last Wave with its themes of the different perceptions of time and the world that the ‘white man’ has compared with native peoples. In this case Amazonian Indians, in the case of The Last Wave Aboriginal Australians. There’s also a link in the effect interaction with these cultures has on the ‘white man’. It’s a film that is about the world, its creation and its destruction. We see the impact of Western culture in its wrecking glory. Both Christianity and alcohol get to make an appearance. There’s a scene where young Karamakate’s rage – at his people and at the white man – leads to something terrible. This is also one of those films that my friends often dislike: subtitled, full of gnomic utterances and philosophising. The sort of film that often gets tarred with the word ‘pretentious’ by people that should know better. Me, I loved it. I liked the uncertainty of it. I like the way the narrative meanders like the Amazon itself. I like the way it opens up an alien culture and a way of seeing the world different to mine. I like the way it doesn’t patronise either the native or white culture but presents the problems that the two present to each other. I like the way it is about ageing, tradition and compromise. I like the way it shows that it is possible to create something that is the worst of both worlds. I like that the acting doesn’t feel too much like acting. I love the cinematography. This is a film that looks astonishing. If you get a chance to see it do so. I’m not foolish enough to think that everyone will like it as much as I did but it is a film worth watching to make your own judgement. Alas, like too many foreign films this won’t be on enough screens so you might have to wait for the DVD release, which will rob you of some of its cinematic glory. But if you get a chance. See it.